Sunday, Sunday, Sunday inbound marketing nation! 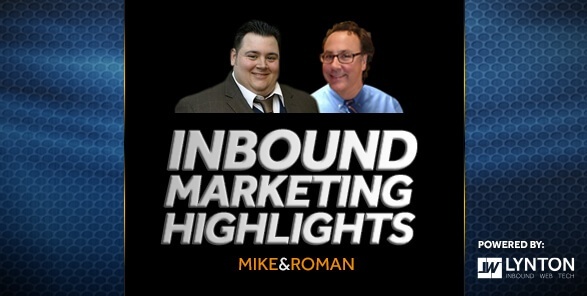 Welcome to Sunday's Inbound Marketing Highlights with Mike and Roman - our enhancement to The Friday Five: Five Headlines from Social Media, Inbound Marketing, SEO, and Web Design, With the addition of our Friday Fails, we still felt that key curated industry headlines from the past week would be valuable to you. And that's how Sunday Inbound Marketing Highlights was born.Use your day of rest to unwind and catch up with our weekly inbound marketing highlights! Which Companies are Totally Nailing B2B Marketing? The interwebs were abuzz about this one. Here's the nugget. If you're guest blogging on spammy sites simply for more links - very bad. If you are guest blogging to offer valuable assets - that's very OK. Cutts was focused on spammy content not thoughtful, purposeful content. Read more at the link above. GoDaddy is expecting a rush of buyers and already has 25 extensions available for preregistration. So far, "thousands and thousands" of people have preregistered, with .guru and .photography endings being the most popular, McLaughlin said. "Domain names are real estate of the Internet, and new land has just been opened up. So getting to stake your claim early is obviously better," he said. The influx of domains will "fundamentally change how people navigate the Internet, with names that are much more meaningful and targeted." Are you poised to snap up a domain name relevant to your business? I believe that most SEO professionals have recovery all wrong. While link removal may help and is often necessary, what Google really wants to see is a site promoted and grown in a way that doesn't revolve around search engines. A successful SEO campaign is designed to be profitable even if the search engines ignore your actions. Facebook to Brands: Get Visual - Digiday. Let's get visual, visual, let's get...wait, sorry. Not gonna click the link above? Ok let me put the puck in the net for you - images and videos are more likely to be seen in user's Facebook feeds. That's it - move along now. Sure you don't wanna click the link? Ever heard of Clippard? No? Me either. They have an Air Guitar and it helps them sell stuff. Actually, no it doesn't. It helps them get conversations started and then they can sell stuff. That's it - our first Sunday Inbound Marketing Highlights is in the can. Let us know what you think.